One of the more convoluted scenarios of Norman Osborn's Dark Reign was his involvement with the X-Men. This group of mutants has had their share of sordid affairs in the past, and Osborn willingly walked right into their business. Osborn understood that mutant-control was critical for his maintenance of power, so striking a deal with the X-Men was his only option. Interestingly, Osborn shared some history with the X-Men prior to seizing control of S.H.I.E.L.D., he was a long-standing member of Sebastian Shaw's Hellfire Club. 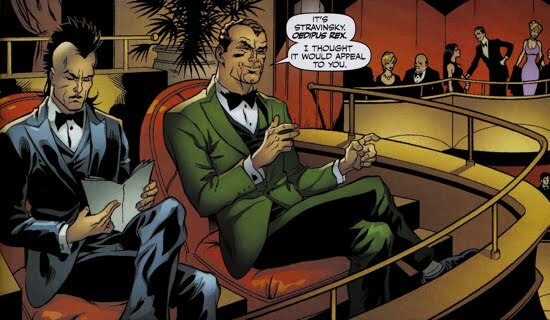 The timeline of Osborn's enrollment in Shaw's aristocratic elite is unclear, however he was first seen at the Hellfire Club after he returned from the 'dead' (ie, his European Exile). This, of course, took place during one of Norman's earlier attempts at feigning legitimacy as he distanced himself from the Green Goblin persona. But the world has changed since then and now Norman was running it, which meant a new deal for the world's mutant population. 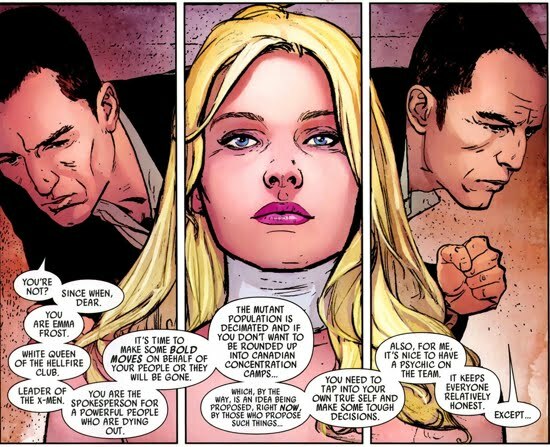 Osborn's involvement with the X-Men centered around one person, Emma Frost, and she proved herself to be a duplicitous one. When Norman recruited Emma to join his Cabal, he convinced her that she was ready to step into the role as the leader of mutant-kind. He explained to her that the mutants worldwide were being decimated and that they were in need of a strong leader, one that would be able to protect them from being gathered into concentration camps or something far worse. Norman volunteered to stay out of mutant-affairs if Emma agreed to police her own. He was not interested in starting a war against mutants, rather, he wanted to ensure the public that the mutants were not a menace. This meant Osborn was going to have to trust that Emma could keep a lid on the mutant population, Frost seemingly accepted his offer. However, she secretly began to manipulate others around her to serve her own agenda, namely fellow Cabal-mate Prince Namor and her X-Men co-leader Scott Summers. During a flashback scene in Uncanny X-Men Annual #2, Sebastian Shaw offered Prince Namor the role as the White King, and rule of the Hellfire Club. Namor flat-out refused Shaw's offer and the furious leader of the Hellfire Club's inner circled demanded that Emma coerce Namor to accept the offer. A romantic spark ensued between Frost and Namor as she pushed for his trust and loyalty. Knowing that Namor despised Shaw, Frost offered to kill Shaw in exchange for Namor's allegiance, Namor accepted. However, Emma tricked Namor by faking her murder of Shaw, using her psychic powers to fool him into thinking he saw her cut off Shaw's head. Emma was successful, which meant Namor was obliged to follow her commands. The first request was for him to willingly join Norman's team of X-Men, the Dark X-Men. Namor agreed to do so. 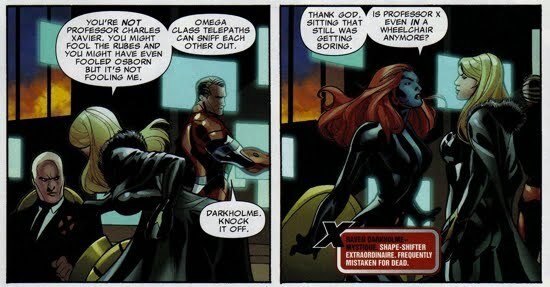 In the one-shot Dark X-Men: The Confession, Emma came clean to Scott Summers about her recent escapades, namely joining Osborn's Cabal. But before she resolved to tell Scott the truth, she had planned to simply kill Osborn or die trying. She was convinced that Scott was aware of her betrayal (ie joining with Osborn) and Emma had preferred death over Scott's belief that she had betrayed him. But, at the last minute, she had a change of heart and decided to not kill Osborn, rather, to stay close to his operations and eventually taken him down from inside. Emma and Scott's relationship was as solid as ever and they both agreed to keep their newfound trust a secret until it was necessary to share it with the world. Emma kept her anti-Osborn agenda secret though, playing along with the whims of Osborn. She would serve as the Cabal's resident psychic, providing a psychic plane for the group to meet, even though their physical bodies were very far apart. She even sought out Norman's help from time to time, when things were out of her hands. In Wolverine Origins #34, Daken had teamed up with his father to track down the mysterious figure known as Romulus. However, Daken betrayed his father and eventually sought out the Murumasa blade, the only weapon capable of killing Wolverine. It turns out that the X-Men were in possession of the blade and when Daken drew the X-Men out into the open, Emma sought Osborn for help. She contacts Norman via a secure channel (interestingly Emma's codename for Norman was Great and Terrible) and asked him to call off Daken. Osborn proved to be no use for Emma, because he had no idea what Daken was up to or his whereabouts. Emma soon began to realize that a deal with Norman may not be all its cracked up to be. Osborn knew that a conflict with the X-Men was inevitable, so in anticipation of that confrontation Norman decided to create his own team of X-Men. His plans to create such a team were kept Emma Frost and he would inform her at the appropriate time. Norman's technique for building up this roster was simple, track down the necessary individuals and tempt them with a glorious offer ('glorious' being relative to the user). In Dark X-Men: The Beginning #1, Norman sought out the mentally distraught Mimic (aka Calvin Rankin) and easily recruited him to join his team. Soon after, Norman tracked down Dark Beast (aka Henry P. McCoy) in a dilapidated train station, where he found the mutant experimenting on human beings, on of his favorite hobbies. 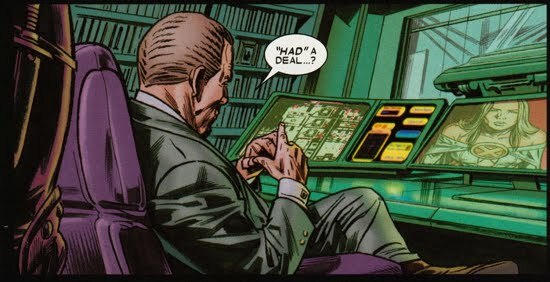 Norman promised Dark Beast state-of-the-art facilities for him to do his research and a guinea pig in the form of the troubled mutant named Omega (aka Michael Pointer). 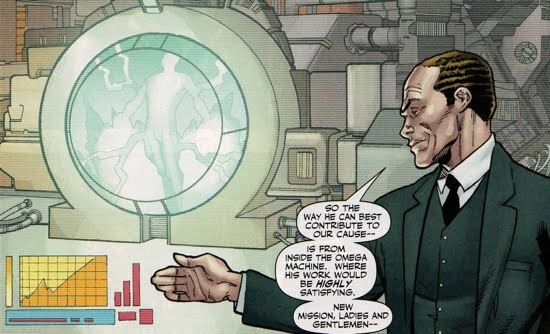 Osborn wanted access to Omega's powers but needed him 'tempered' to make him a better team player. McCoy seemed very content being in seclusion and free to do as he pleased, but Osborn insisted that he could still be himself as long as he 'toed the line'. McCoy eventually agreed to join Osborn, but it seemed that the major contributor to his compliance was that the was a huge fan of Norman, well, more of a fan of the Green Goblin aspect of Norman. Norman continued to add to his X-Men roster in Dark X-Men: The Beginning #2. His next set of recruits were the duo Cloak and Dagger, who happened to be in Colombia fighting drug lords. Technically, Cloak and Dagger are not mutants, but Osborn explained to them that they are in the eyes of the public they might as well be, and frankly that is all that matters. Osborn enticed the duo by explaining the advantages they would have if they joined his effort. With the police off of their backs and the government's support in their favor, they would be able to make marked changes in the world-wide illegal drug trade. Osborn's offer was too tempting and the duo agreed to join Osborn, they felt they had no choice. Next, Norman made his way to Michael Pointer (aka Omega), who had given up his alter-ego and had been working at a construction site. Osborn was aware of Pointer's troubled past that his power-set had caused, for he was responsible for the death of a number of mutants in Canada. Norman promised to help Pointer so that he would not kill more innocent people again. After Pointer proved reluctant to join, Osborn coerced him further by staging a MGH (mutant growth hormone) leak near the construction site. If normal human beings were to be exposed to this, they'd become mutants, if they were mutants around Pointer, they'd die. Pretty simple plot. Pointer feared this outcome so he left the site with Osborn and joined his team. Eventually Norman made his way to the mutant already on his Avengers roster, Daken, son of Wolverine. Daken joined Norman's Dark X-Men as well, even though he was reluctant at first request. 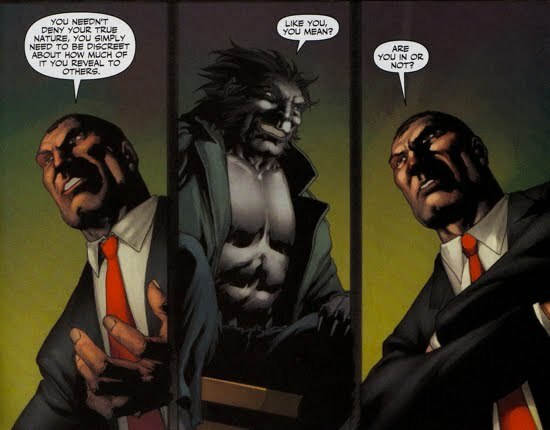 Osborn knew that Daken was a necessary member because he provided the 'offensive muscle', which would be indispensable if Logan ever came around for a fight. Norman finalized the roster for his X-Men team in Dark X-Men: The Beginning #3. However this final selection would not be a part of his public team, rather, more of black ops agent. After 'Wolverine' tore threw a group of H.A.M.M.E.R. soldiers, Norman knew he had finally tracked down Mystique (aka Raven Darkholme), who had been impersonating Wolverine in order to soil his reputation. Mystique flat-out refused to join Norman, but suddenly changed her mind once he informed her that Wolverine's son Daken was a member of his squad. Her vendetta against Logan proved to be too much to resist, Osborn knew that and guaranteed her compliance. 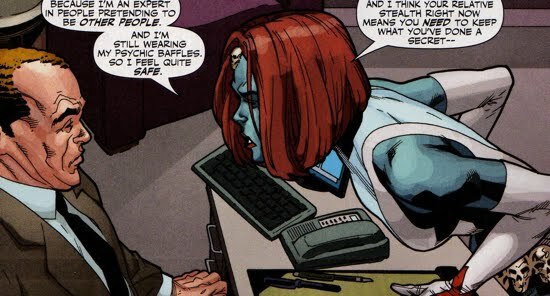 As an added measure of security/compliance for Mystique, Osborn utilized an experimental behavioral modifying technique similar to what was used on him during the days of the Superhuman Civil War. Osborn had nano-machines placed into Raven's bloodstream that could do anything from sending debilitating electro-shocks to detonating as a bomb if she were to get out of control. Norman planned on using Mystique for PR purposes, that is, she would impersonate known (heroic) mutants and sway the public as Osborn saw fit. Norman was able to recruit every person that the we wanted to join his X-Men, except one. Jeanne-Marie Beaubier (aka Aurora) was approached by Osborn and the multi-personality suffering mutant was put in check by Norman when he placed a thalamizer on her. The thalamizer allowed Osborn to access her more adventurous personality (which housed Aurora) and he attempted to persuade her to join. Aurora proved too much for Norman to handle, and she soon placed the thalamizer on him after pulverizing the thugs he brought with him. She refused to join Osborn because she did not agree with the person who she saw as running the show, the one and only Green Goblin. Norman's team was now set and the recruiting task was completed just in time for a mutant flare-up to occur. In recent years, the X-Men had relocated their base of operations in San Francisco and things seemed to be going peacefully for them. But that ended abruptly when Simon Trask and his coalition named Humanity Now! introduced the Proposition X initiative. Trask's decree was that all humans that are X-gene positive (ie, mutants) undergo mandatory chemical birth control procedures. This proposition was not well accepted by the mutant population, so when Trask and his coalition staged a march on San Francisco they were met by anti-Proposition X demonstrators. 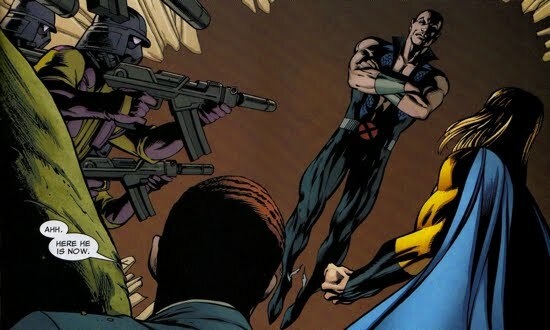 The anti-Proposition X demonstrators were led by the real Beast (aka Hank McCoy) and it did not take long for violence and chaos to erupt when the two opposing factions came in contact with one another in the one shot Dark Avengers/Uncanny X-Men: Utopia. Osborn was quickly apprised of the violence that had occurred in San Francisco, so he dispatched his Avengers to end the conflict. 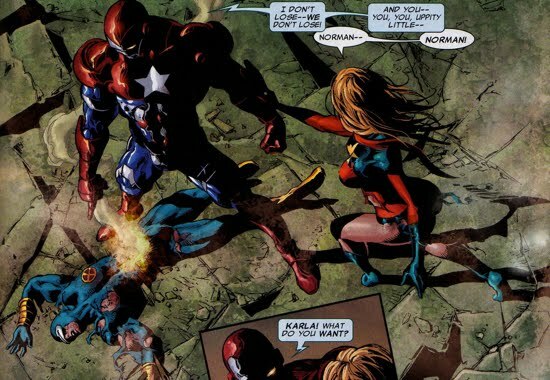 Assigning each of his Avengers (except the Sentry) a hot zone to police, Norman instructed his team to restrain and arrest any mutant that was breaking the law. His team did so quite effectively and Scott Summers knew that a direct assault against Norman's Avengers would not be fruitful. Meanwhile, Emma caught up with her Cabal leader and Norman offered up a new plan to the mutant. 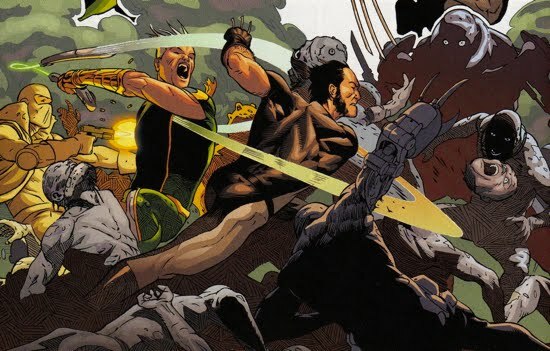 Since Summers could not get his mutants under control, Osborn was enacting a new strategy, he would use his team of X-Men, led by Emma Frost, to stop the conflict. 'Mutant problems Mutant solutions' was Norman's catchphrase for resolving this conflict peacefully. Emma accepted the role as the leader of Norman's X-Men, shortly after, Norman addressed the media. He informed the press that martial law was being declared in San Francisco and he requested that Scott Summers, the supposed instigator of this conflict, turn himself in to the authorities. Summers did not, and he fled H.A.M.M.E.R. custody. Norman saved his best surprise for last, he had Professor Charles Xavier speak to the press and publicly distance himself from Summers and his actions. This, of course, was Mystique pretending to be Xavier, the real Xavier along with the real Beast were in H.A.M.M.E.R. detention cells on Alcatraz Island. 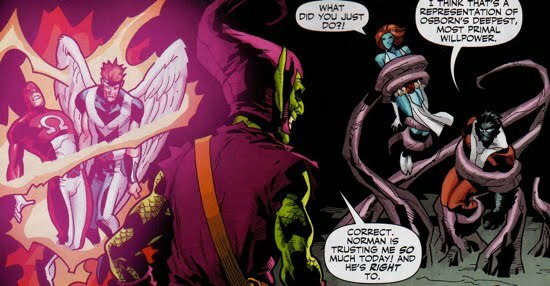 No one, except Norman Osborn, was aware of that fact. 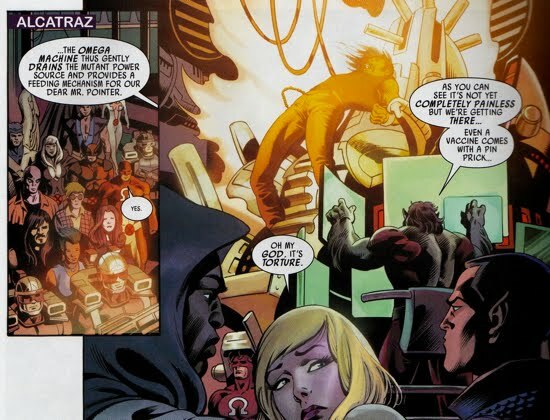 Norman had confronted Xavier and requested to speak with him in X-Men Legacy #225, Xavier must have been placed in H.A.M.M.E.R. custody shortly after that. The Utopia story arc continued in Uncanny X-Men #513, where Osborn and the Mystique-Xavier continued to address the public. Osborn issued a decree for Summers to step down as the de facto leader of the X-Men, he cited that his compliance would lead to a peaceful resolution. Osborn claimed no ill-will toward the mutant population, he was not going to choose sides between Trask and Summers. However, Norman secretly began his plans to use the Omega Machine, a device with the capability to siphon a mutant's power effectively neutralizing them. His first use of the machine would be on the real Beast, whilst, ironically, the operator for the machine was Hank's doppelganger, the Dark Beast. Soon after, Osborn led Emma Frost to meet her new team, Osborn's assembled X-Men team. The roster included Cloak, Dagger, Dark Beast, Mimic, Daken, and Omega. Frost made one final addition to the roster, Prince Namor. Namor and Osborn discuss their mutual benefit for working together in Dark X-Men: The Beginning #1. Much to Norman's suprise, Namor was willing to cooperate with Osborn's objective. Of course Namor's compliance had little to do with his allegiance to Osborn, rather, his prior agreement with Emma Frost. Emma then went public with her team at a press conference as she announced a city-wide curfew with the aim of curbing the recent violence in the streets. However, a small group of mutant teenagers take to the streets as they begin destroying San Francisco's Union Square. Their actions force Emma's hand and she and her team are forced to arrive and quell this mutant attack. In Dark Avengers #7, Osborn and the Dark Beast discuss the Omega Machine as Norman expresses his discontent for McCoy's progress. Osborn was under the impression that the Omega Machine would painlessly sap the powers away from the mutants, and not torture them. But the real Hank McCoy appeared to be being tortured by the machine, this was unacceptable in Osborn's opinion. After leaving McCoy, the disgruntled Osborn tried to pacify The Sentry's angst with all the violence occurring in San Francisco. Norman told Reynolds this was a big win for the Avengers, he did not appear to be convinced by Norman's sentiment. Meanwhile, Emma and her team able to quickly neutralize the young mutants that caused the ruckus at Union Square, the media was there to record the incident. Back at the H.A.M.M.E.R. Alcatraz base, Scott Summers arrived to confront Osborn. However, he did not arrive to surrender himself, rather, to have Osborn evacuate the San Francisco area. Norman did not comply and Summers left as quickly as he had arrived, the battle lines were officially drawn. Soon after, Emma returned to base after her X-Men's successful debut, but tempers began to flare as she disagreed with the treatment the mutant prisoners were receiving. 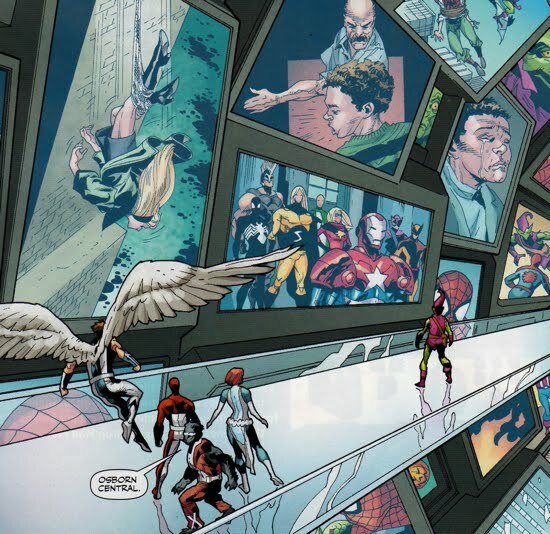 Osborn tried to convince her that everything was humane, but she demanded to see where all the mutants were being held. 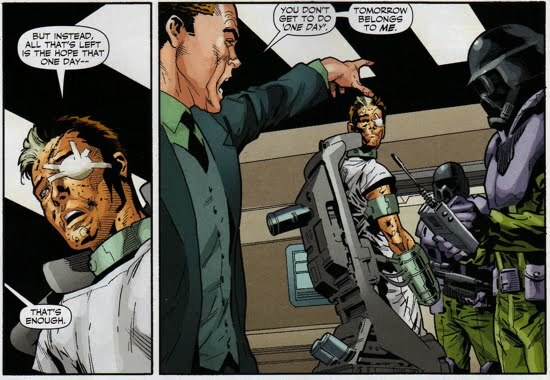 While Norman left with Emma toward the prison ward, Hawkeye (aka Bullseye) and Daken continued to antagonize each other. Eventually, an all-out brawl broke out between the Dark X-Men and the Dark Avengers, things were in complete disarray. 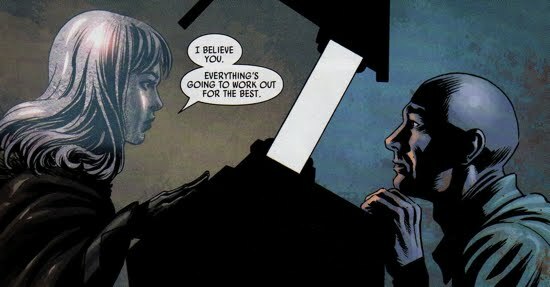 As Emma was perusing the prisoners, the real Professor was able to psychically connect to her and he informed her that Osborn was lying. Emma had began to suspect that anyway since she had requested to see the real Hank McCoy and Osborn told her that he was not in his custody. To further complicate matters, Simon Trask, who had been taken into custody, enacted his own plan to address the mutant problem. He activated a new breed of human sentinels to exterminate the world's mutants. The action continued in Uncanny X-Men #514, as Emma and her team halt their skirmish with the Dark Avengers and head to San Francisco's Northern Park to confront Trask's sentinels. Frost's team was able to easily defeat the sentinels at Northern Park and she then contacted Osborn for further direction. Norman informed her that the Trask was last seen at St. Francis Hospital and that Trask was most likely directing the sentinels from that location. Frost's team quickly made their way to the hospital. Frost and her team made quick work of Trask at the hospital, and the public perception of Osborn's X-Men continued to garner public support in Dark Avengers #8. However, Cyclops was making plans of his own, he sent Wolverine and a group of fellow mutants to infiltrate the H.A.M.M.E.R. base at Alcatraz. Wolverine and his team were able to rescue the captive mutants, and in the process, Emma was forced to show her true allegiance. She aided Wolverine in the escape of the detainees by neutralizing Daken, while Namor quickly subdued Mimic. The opinions of Cloak and Dagger were easily swayed once they realized the nature of the Omega Machine, they immediately joined Frost and Namor's mutiny against Osborn. When the news of Emma's betrayal reached Osborn, he immediately summoned his Avengers to exact revenge upon Summers and his team. Scott (or as Norman refers to him 'Scotty') had one last trick up his sleeve. He raised the Asteroid M from the depths of the Pacific ocean and declared it the new refuge for all mutants world-wide, their new Utopia. The story arc reached its conclusion in the one-shot Dark Avengers/Uncanny X-Men: Exodus. Osborn took his beef with Summers right to the his doorstep when Osborn launched a full-scale attack on the X-Men's new Utopia. Initially, Osborn had the upper hand on Summers as he pummeled him mercilessly, but things soon changed. Emma was able to locate the real Professor X on Alcatraz, and the duo devised a plan to neutralize the ace up Norman's sleeve, The Sentry. Emma and Xavier were able to psychically place Reynolds in his 'white room', a serene place where Reynolds would go if things went wrong. Emma was able to 'hold' the Void long enough for The Sentry to come to his senses, this caused him to flee the melee, making him essentially useless for Norman's cause. As a result, Emma was forced to hold the Void inside of her, she was forced to remain in her diamond form to prevent the Void's escape. Meanwhile, Ares was subdued by Valkyrie (aka Dani Moonstar) who had recently made a deal with the Asgardian goddess of death (aka Hela) who had restored her Valkyrie power once more. With the Sentry out of the picture and Ares thwarted by Valkyrie, Summers was able to turn the tables on Osborn. Cyclops did not use brute strength to do so, in fact, quite the opposite. Norman had Cyclops completely defeated, but when he looked up he was facing the entire mutant population. With the media filming the whole thing, Osborn knew he could not wage war against all of them. He ordered his Avengers to fall back. Later at a press conference, Osborn declared victory over what he called 'the militant mutant menace', citing that their relocation to their Utopia was as effective as imprisonment. He publicly praised his Avengers and his X-Men, while slandering Summers and his team of defectors. Even though Norman was able to convince himself that he had struck a victory over the X-Men, he still sought revenge against those that betrayed him, namely Frost and Namor. Osborn made his first attempt at avenging Namor in the one-shot Dark Reign The List: X-Men. Norman dug deep into the H.A.M.M.E.R. war chest (specifically the Global Aquatic Warfare chest) and found Marrina. This ferocious prehistoric fish-looking monster was half human and half Plodex (an alien race), and when it was in its humanoid form it had been once married to Namor. Osborn took Marrina spliced in some shark DNA and gave it in an insatiable appetite for Atlantean blood then set it loose in the Pacific Ocean. The result was the slaughtering of innocent Atlanteans and Namor was unable to protect them. Soon after, Namor along with Cyclops and Emma Frost devised a plan to lure the monster to their new home at Utopia. Once Marrina arrived, a true team effort followed as Wolverine, Ice Man, Nightcrawler, Psylocke, Magik, Pixie, and Colossus all cooperated to defeat the monster and rescue the remaining Atlanteans. Namor then took the subdued monster and tossed her threw the window of Norman's Los Angeles Oscorp offices, Norman happened to be there at the time. Namor proceeded to threaten Osborn's life, but the unflappable Osborn simply responded, "be seeing you, your highness." 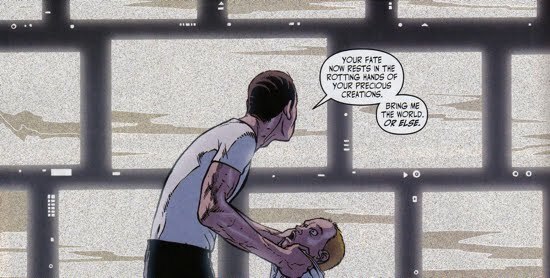 Scott Summer's anti-Osborn propaganda during the events of the Utopia arc was not something that went unnoticed by the rest of the superhuman community. Deadpool, who had his roots in the X-Men's exploits, saw the Summers broadcast and immediately rekindled his hatred for Osborn. Deadpool, who had temporarily granted a reprieve from his assault on Norman after a pact was made with Hawkeye (aka Bullseye), resolved to aid Summers and his efforts with the X-Men. The problem was that Cyclops did not want Deadpool's help, the mercenary was too much of a loose canon. However, to mitigate the situation he gave Deadpool a probationary spot on the team. In Deadpool (V2) #17, the mercenary went on his first mission to 'help' the X-Men, he was going to assassinate a man by the name of Ellis Kincaid. Kincaid was the father of the mutant Mercury, who was currently residing at Utopia. He claimed that his daughter was being held against her will, which was not true, but the sensitive media situation that followed created more turmoil for the X-Men. After learning that Deadpool was not killed (as Hawkeye had informed him), Osborn quickly confronted his Avenger with his disappointment. But Osborn did not fret for long, because he realized that Deadpool's presence caused a much bigger problem for Summers than it did for him. Osborn, who had Kincaid in H.A.M.M.E.R. custody, placed him in the care of two inept guards and sent them to the very public location of train platform. 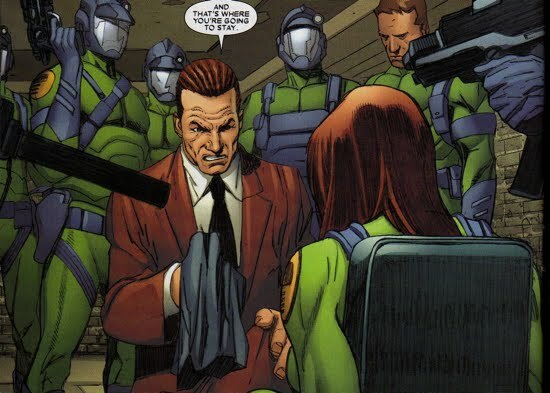 Osborn's intent was to help Deadpool assassinate Kincaid as to further his anti-X-Men agenda. 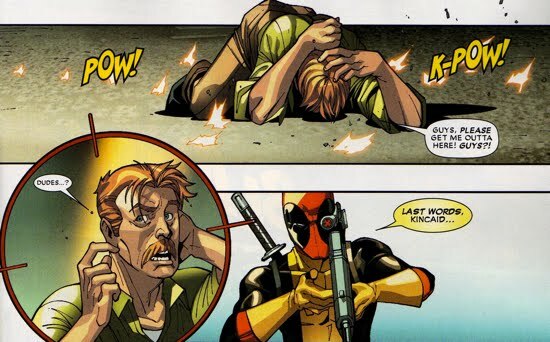 When Deadpool failed to pull the trigger, Osborn used his own assassin to kill Kincaid in Deadpool (V2) #18. Luckily, Wolverine stepped in to save Kincaid from the hail of bullets and soon after, Kincaid confessed that Osborn made him say all those terrible thing about Summers and his X-Men. Norman does some quick damage control by pulling the media off the scene as to stifle Kincaid's confession. Deadpool had proven to be a thorn in Osborn's side yet again. Of course, what kind of a war against the X-Men would be complete without a few hiccups involving Wolverine. Wolverine had a handful of run-ins with Osborn alongside Spider-Man and the rest of the New Avengers, but he also had his own solo-missions involving Norman. Osborn had a very brief involvement with Wolverine's efforts to take down the private military contractor known as Blackguard. This contractor was trying to duplicate the powers the comprised Wolverine (ie healing factor, adamantium claws, etc). Although Norman did not fight Wolverine directly, he was forced to severely reprimand the H.A.M.M.E.R. agent (named Gertrude Jacks) that aided Wolverine's escape from his custody in Wolverine Weapon X #5. Later, Osborn recruited the man named Mr. X, who nearly defeated Wolverine in hand-to-hand combat, to his Thunderbolts team in the one-shot Mr. X Wolverine. 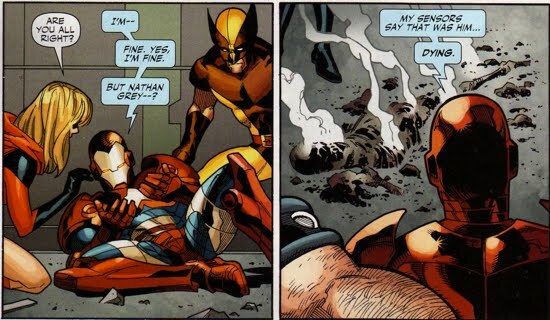 Perhaps Norman's most direct conflict with Wolverine occurred in the one-shot Dark Reign The List: Wolverine, where Wolverine's origins once again came to light. The Weapon X program that created Wolverine was actually part of a Weapons Plus program that led to the creation of a series of living weapons. These weapons were created in an above-top-secret living engine called The World. 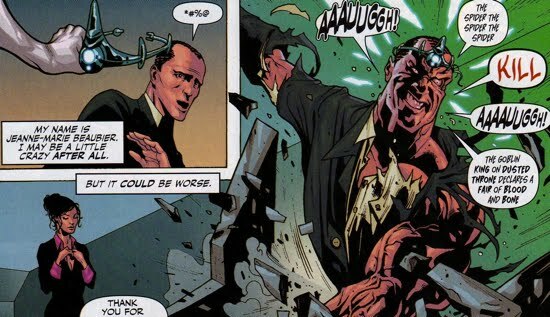 The power-hungry Norman Osborn wanted access to The World (or to have it destroyed whichever came first), so he sent his H.A.M.M.E.R. agents to seize control of the operation. However, the recently Dark Avenger-defecting Marvel Boy (aka Noh-Varr) anticipated Osborn's move and sought out Wolverine to stop the H.A.M.M.E.R. assault. The two arrive at The World and are immediately greeted by Fantomex (a fellow Weapons Plus program creation) as well as some zombie-like creatures. It turns out the zombies were a creation of Osborn's with the sole purpose of infiltrating The World (I'm not very sure why they had to be zombies to do that...). Anyway, the zombie Agent 18 eventually made its way to The World's Brain, but before he could return piece of it to Osborn, Wolverine sliced and diced him real good. Mission not accomplished. Fantomex used a shrink ray (that he had stolen from Dr. Doom) to shrink The World down to a size that could fit in the palm of Noh-Varr's hand. Fantomex took The World with him when he left, with the goal of eventually refashioning it took create things other than weapons. Norman was going to have to wait to settle the score with Wolverine. Although Norman's efforts with the Emma Frost led Dark X-Men fell flat on its face, he kept the remaining (loyal) recruits in his employ. The team had shrunk in size and the group that remained consisted of Mimic, Omega, Mystique, and the Dark Beast. In Dark X-Men #1, Norman sent his team to investigate a series of strange occurrences in which people were falling into a trance-like state and calling themselves X-Men. The team went to Burton, California to investigate one of the victims. Their endgame was nothing more than PR, to ensure the people that mutants would deal with these apparent 'mutant' problems, the was to be no substantial effort at all. However, when the team reached the patient, Omega and Mimic were possessed by an explosive mutant-energy. This left Mystique and the Beast to deal with the person responsible, Nathan Grey (aka The X-Man). In Dark X-Men #2, Nathan Grey disappeared as quickly as he had arrived, while Norman's team issued damage control informing the locals that an alien had possessed the civilians, which caused their trance-like behavior. 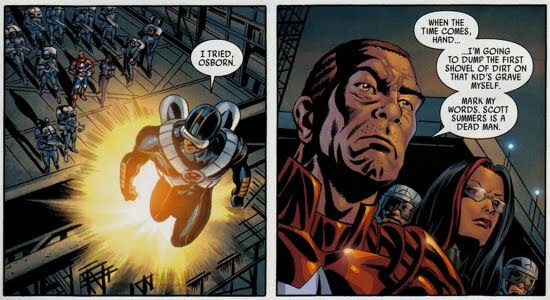 Osborn quickly recognized the extreme amount of power that Grey had, being a God-like being, so Norman instructed his team to capture him. Osborn would then plug Grey into the Omega Machine, where his immense power-set would be drained and re-appropriated quite effectively. Osborn's team was reluctant to take on the mission, since they believed themselves to be very outmatched. Regardless, they soon found themselves at H.A.M.M.E.R's Psi Division, led by Dr. Alex Jarl. The Psi Division offered safe refuge for former psychic criminals, villains and mystics, as they transcended beyond the individual and formed a collective Psi brain. The Dark X-Men team requested that Jarl use this 'collective brain' to access the entire human consciousness to find the whereabouts of Nate Grey. Jarl agreed to do so, however, when he attempted to do so, Grey began siphoning off the psychic's power and he used it to learn everything that Osborn had done in his absence. Furious with Osborn's recent transgressions, Grey attacked Avengers Tower in Dark X-Men #3. After quickly defeating the first wave of defense at the tower, Grey found himself face-to-face with Osborn's Avengers team. Grey escaped into a timestream limbo, but the Avenger Ares (using his God-like powers) was able to follow him into the timestream and yank him out of it. The X-Man appeared to be dead, but then suddenly his body exploded in a flash of bright light, nothing remained except some charred remains. Norman thought that the matter was closed and that Grey was defeated but Mystique soon realized what had happened. 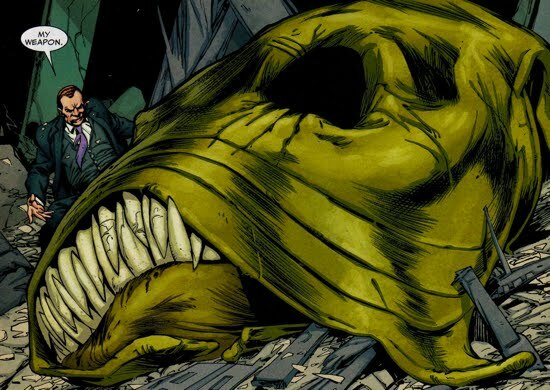 Grey had used that explosion to jump bodies and he was now inhabiting that of Norman Osborn, while Norman's conscious was buried deep away from the surface. Mystique used that knowledge to bribe Grey into freeing her (ie removing the explosive devices in her body), but Grey would not comply. Their conversation continued in Dark X-Men #4, and Grey informed Mystique that he will not free her until she redeemed herself. But Osborn proved to be a restless captive and Grey had underestimated how difficult it would be to suppress Osborn's true conscious. Having the initial plan to try and free Summers and the rest of the true X-Men, Grey had to cancel that mission as he struggled to keep Osborn from taking his own body back over. Meanwhile, Osborn's team decided to return to the Psi Division and to plug themselves into the 'collective brain' so that they could free Osborn. Their goal was motivated by the fact that they all sought to earn Osborn's trust, they believed that helping him now would accomplish that. As Osborn expended his mental energy to fight off Grey, the vulnerable Osborn was now susceptible to his X-Men team's entry into his psyche. Unfortunately for Osborn's team, they don't find Grey inside Osborn, rather the Green Goblin, and the Goblin soon escaped and ran around unchecked inside Osborn's psyche. The Green Goblin made his escape from the prisons of Osborn's mind and headed for the 'Osborn Central' (ie Norman's conscious control center) in Dark X-Men #5. Grey's endgame for freeing the Goblin was to have Norman relapse publicly as the Green Goblin, causing his 'reign of terror' to conclude. However, Grey's plan backfired on him, because once the Goblin took control of the helm, it teamed up with his 'normal' psyche. The result was that Norman gave the Goblin control to do as he wished and in their mutual interest, the Goblin used Mimic and Omega to drain the powers away from Grey. This caused Grey to lose control over Norman, and thus the interloper was removed. When the group left the psychic plane to return to the real world, Grey was placed into custody and plugged into the Omega Machine. Osborn and the Green Goblin were victorious. Norman's next dealings with the X-Men would be during his siege on Asgard. And although that ended his reign as the leader of the peacekeeping task force, Osborn's affects on the X-Men would be long-lasting. Their expulsion to the island Utopia was a landmark event for their people and something that would last for a long period of time after Osborn was incarcerated.